March 5-11, 2017, all locations – American Institute joined in the week-long international celebration of the contributions made by dental assistants. This year’s theme for Dental Assistant Recognition Week (DARW) was “Patient focused with passion and purpose,” reflecting the growing importance of dentistry’s role in health care and the responsibilities of dental assistants. The Toms River campus hosted a lunch for dental assisting students and faculty. Guest speaker Dr. Greenberg of Mt. Holly Family Dentistry, spoke about the role of the dental assistant and what dentists expect from an extern coming into the office. 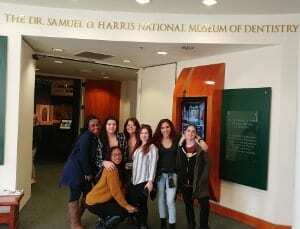 A group of 12 students and two faculty members also traveled to Baltimore to tour the National Museum of Dentistry. Designated by Congress as the official museum of the dental profession in the U.S., the museum houses an extensive collection of more than 40,000 dental instruments, furniture, artwork and exhibits focused on the importance of oral health. For many of the students, it was an eye-opening experience. “The students were very impressed by the history of the leaders in dentistry, including the many women and minorities who have held and now hold significant rolls in dental education and in professional organizations,” said Ms. Fitch. Congratulations and thank you to all our dental assisting students, faculty and graduates for their dedication to this valuable profession. A week isn’t long enough to honor your many contributions.